The threat of my house catching on fire is haunting. Fire can spread quickly and in unpredictable ways, bringing a great potential for destruction. Though fire can be erratic, we do know there are three things needed for a fire to burn: heat, oxygen, and fuel. In light of this, safety experts suggest keeping a fire blanket handy at home, especially for small kitchen fires. A fire blanket is a nonflammable covering used to contain a small fire from getting out of control. It’s designed to contain the fire by preventing oxygen access, thus smothering the fire into submission. The blanket provides a covering in order to suffocate the flames. You and I have fires that pop up everyday, and they are (hopefully!) not in our kitchen. Every wrongdoing we experience is an ember, and we have an opportunity to smother it immediately or allow it to catch into a smoldering wildfire. Each insult, injury, or inconsideration encountered is a chance to cover the offender in love. When we obsess over the attacking flame on our doorstep we breathe life into it and allow it to burn bright, instead of immediately smothering the offense with love. Love covers. It quickly blows out the flame of irritability, resentment, and pride. Again and again and again. It suffers long toward every ember that tempts to take over. Love is shown in the response we make toward wrongdoing. We don’t need to go out looking for fires to put out, we each have enough to go around. Fires pop up every day, and in those moments when we begin to feel the heat, we have a choice to feed the fire or smother it into submission. “I will greatly rejoice in the LORD; my soul shall exult in my God, for he has clothed me with the garments of salvation; he has covered me with the robe of righteousness,” (Isaiah 61:10). Jesus smothered our sin into submission, then He gifted us His righteousness. This act of love covered over you and me in a way we cannot fully comprehend on this side of eternity. And as we attempt to grasp the reality of Christ’s covering, let’s move toward extending a covering of love to those around us as extravagantly as Christ did for us. PRAY THIS WITH ME: Jesus, I praise You for Your covering of grace and forgiveness. Never let me forget what You have saved me from. 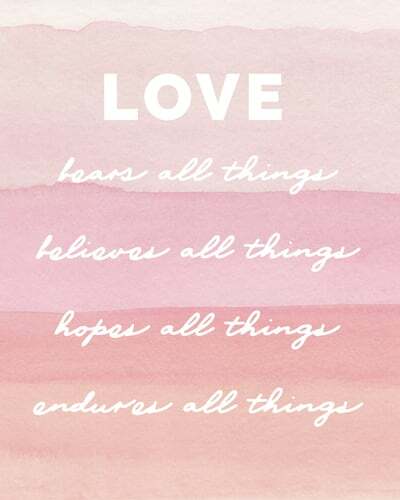 Help me to see the fires that need covering and enable me to douse them with love today. 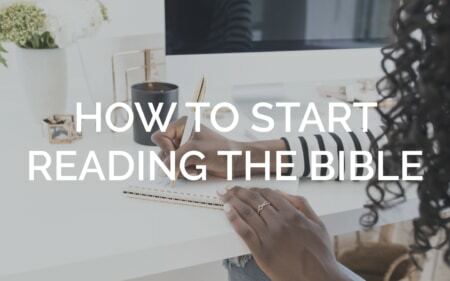 Ready to start reading your Bible? Not quite sure how or where to start? You’re in the right place! 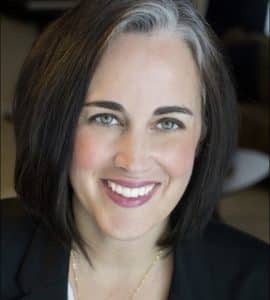 I’ve been in your shoes and I’ve since turned the corner and now help thousands of others learn how to begin reading and studying the Bible … and how to keep going. I know you want to open your Bible, read what’s on the page, and understand it immediately. Yet there are many barriers that keep us from doing just that. This goes without saying, but you need to get a copy of the Bible in order to read it. You probably already have one, but it may not be the best fit for you. There are a bunch of different Bibles on the shelves at the Christian bookstore and it can be super-overwhelming to know the difference between them all. Here is a post all about the different types and versions, if you are interested. But the bottom line is this: use a version you can read easily. If you’ve had a Bible for years, but the reading level is way over your head, consider grabbing a version that is easier to read. The New Living Translation Full Disclosure: At no additional cost to you, I earn a commission if you click this link and make a purchase. Thanks for your support! (NLT) or the NET Bible Full Disclosure: At no additional cost to you, I earn a commission if you click this link and make a purchase. Thanks for your support! are both very readable and great for beginners. Probably the most common barrier to reading and understanding the Bible is a lack of habit. In fact, I often have to go back to this step, even after decades of reading and studying the Bible. Because I cannot gain more understanding without a regular routine of opening my Bible. Until we have established the habit of regular Bible reading, understanding is going to be hard to come by. Why? Because without the habit, you’ll start off strong but fizzle out by the end of the week. How do I know? Been there. Done that. My guess is, you have to. Here are a few thoughts to consider as you embark on creating a rhythm of regular time in the Bible. Start small. Choose something that will give you the quick win! Ex. : These short reading plans range from 8 days to 31 days. Schedule a date with God. Don’t worry about finding that perfect time, simply look at your schedule for tomorrow and pick out the best 10 minute slot. Put it on your calendar and get ready for it like it is any other appointment. Here are three more tips about establishing a regular quiet time with God. Make it enjoyable! Grab a new coffee mug or some yummy hot chocolate reserved only for your time with God. Buy a new blanket to cozy up with, or a pretty basket to keep your Bible in. I like to keep tissues and sticky-notes with my favorite pens Full Disclosure: At no additional cost to you, I earn a commission if you click this link and make a purchase. Thanks for your support! handy in case I need to jot down something I need to remember to do later. Keep going. Don’t give in to the paralysis of perfectionism. Resist the thought that reading for 5 minutes isn’t enough. Five minutes of reading one Bible verse is better than none read at all! Invite a friend to read the same plan and consider meeting up in a week or so to talk through what you’ve read. 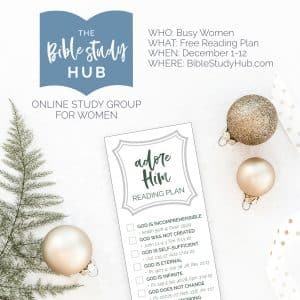 If you are not sure who to invite, consider an online Bible study group. Once you are in a regular rhythm of Bible reading then you can begin to focus on understanding what you see in the pages of Scripture. You are not going to understand everything you read. The Bible is a deep, complex masterpiece. There are certainly many truths we can easily see on the surface, but there is much more below than can be mined. It takes time to put all the pieces together. The Spirit of God lives within you. Though you may not comprehend everything right away, if you are a Christian, you have the very presence of God within you to guide and teach you as you read! Remember the end goal of Bible study. It’s not simply to gain knowledge. The end goal of Bible study is worship. Bible study is about getting to know our magnificent God! Opening your Bible with a heart of expectation is an act of drawing near to Him. Even if you walk away scratching your head about what you just read, it is still an act of worship. A step closer to experiencing God in your everyday. Look into investing in a good study Bible. The helpful notes and charts found throughout are invaluable in helping with understanding what you are reading. 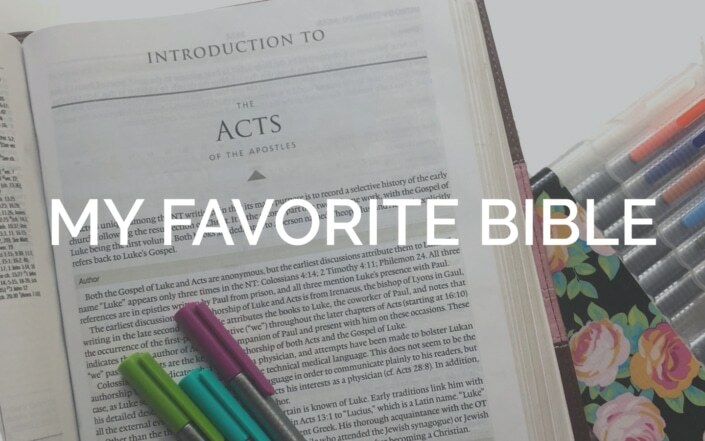 Here is a post all about my favorite study Bible. There are two main lanes of Bible study that will help us begin to understand the Bible: the “bird’s-eye-view” and the “bug’s life.” Both perspectives are important elements in our journey toward comprehension. A bird’s-eye-view of the Bible provides a big picture perspective and helps us connect the dots between all the different pieces. I learned many Bible stories in my early years, but I lacked a basic timeline and understanding of how all the characters are associated. Reading plans through a book of the Bible and reading through the Bible chronologically are an excellent way to gain this critical viewpoint. There is much to be gained from that big-picture vantage point, but we can also learn from the details the “bug’s life” can provide. 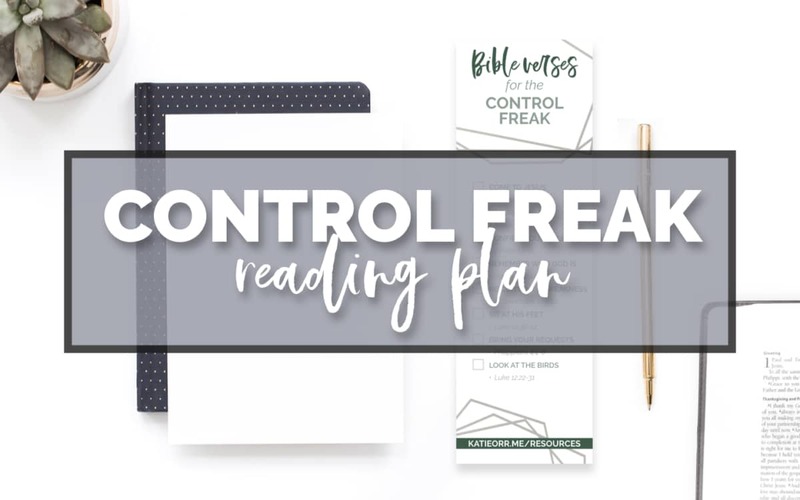 When we dig deeper into a passage—zoom in to a small portion of Scripture and take our time while we are there—we begin to see details we never noticed on a quick read-through. 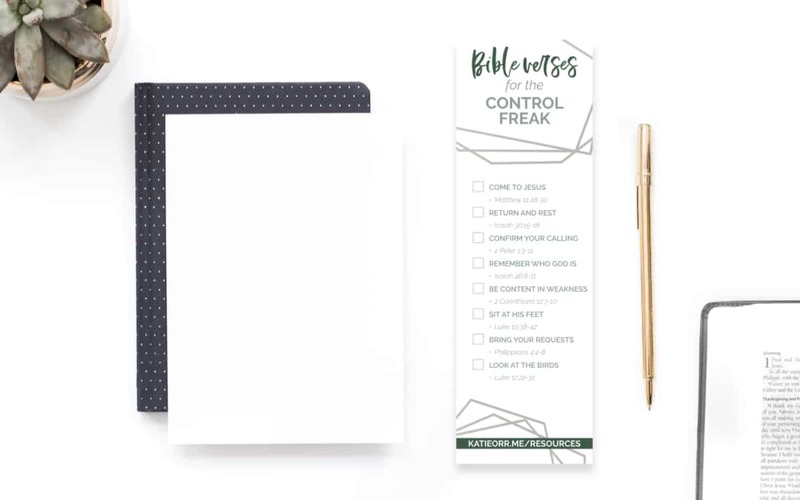 And these details can be seen in as little as 15 minutes a day through these Bible studies for busy women. Both are lanes of Bible study are necessary. Both help us enjoy the Word. Both help us see God more clearly and worship Him better. God created us for community. Specifically, His will is for each of us to be a member of and involved in a local church. Most local churches have some sort of small group Bible study option. Finding a church home and a small group will be a great step towards experiencing God daily. You don’t have to have all the right words. It can be in your head, spoken out loud, or written out in a journal. Simply express to God your desire to know Him better through His Word. He desires the same. It’s His will for you to experience a deep and enjoyable time in the Bible. If you ask Him to help you create the habit in order to understand what you encounter and worship Him better, then you make consistent choices toward that end, He will answer that prayer! Without fail. What other questions do you have about getting started in regular Bible reading? There are seasons that are hard. I just don’t feel right. Discouragement comes easy. The dark cloud looms and lingers. I begin searching for what’s missing. Maybe if I start running, or eat better I will feel better about myself? Or, am I lonely and just need to find a new friend? Get more sleep? A better schedule? Time alone? A date night? I’ll try a few things, and when the newness wears off I turn to what energize me. Teaching the Word, blogging, time with good friends, time alone to plan. While they do help recharge me, they will never be enough. Only God’s word brings me life. In uncertainty, His word alone is my good counsel. 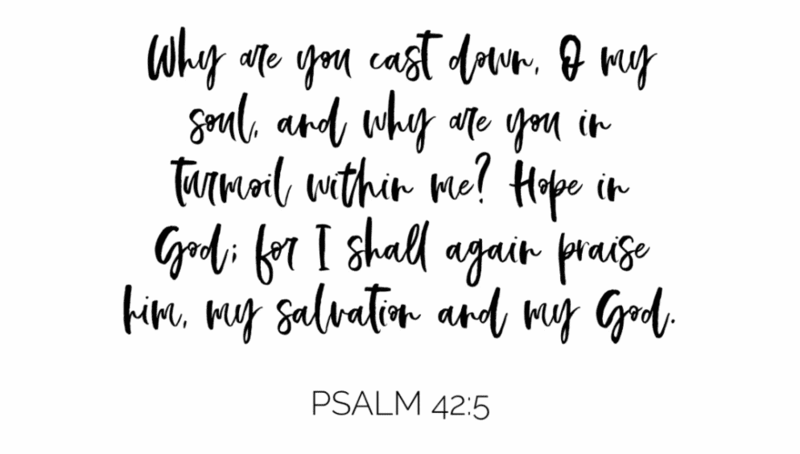 When my soul cries out, His promises alone bring comfort. Though there are moments of overwhelming sorrow, His word under-girds with strength. His mercy and grace is what I truly need. Not a smaller jeans size, or a better organized house. Not a new friendship or time to myself. He is my missing piece. Which verses do you cling to when the dark cloud looms? I’ve long said that we need to stop “trying harder” and focus our efforts on “believing better.” For years, I tried and tried and tried to be good—sure I was going to get it right this time. Yet when I failed (and I always did), I was surprised and disappointed in myself. I looked around, and it seemed like everyone else had it all figured out … they must know something I don’t. Or maybe they are simply working harder at being good. I need to try harder. Then I’ll quit messing up so much. Finally, I heard about grace and I stopped trying so hard to be good, and I began to rest in His goodness. And the more time I spent with Him, the more I desired more. I started actually reading Bible verses about God and realized that my view of God was way off from what His Word tells us. “It is impossible to keep our moral practices sound and our inward attitudes right while our idea of God is erroneous or inadequate” — A.W. 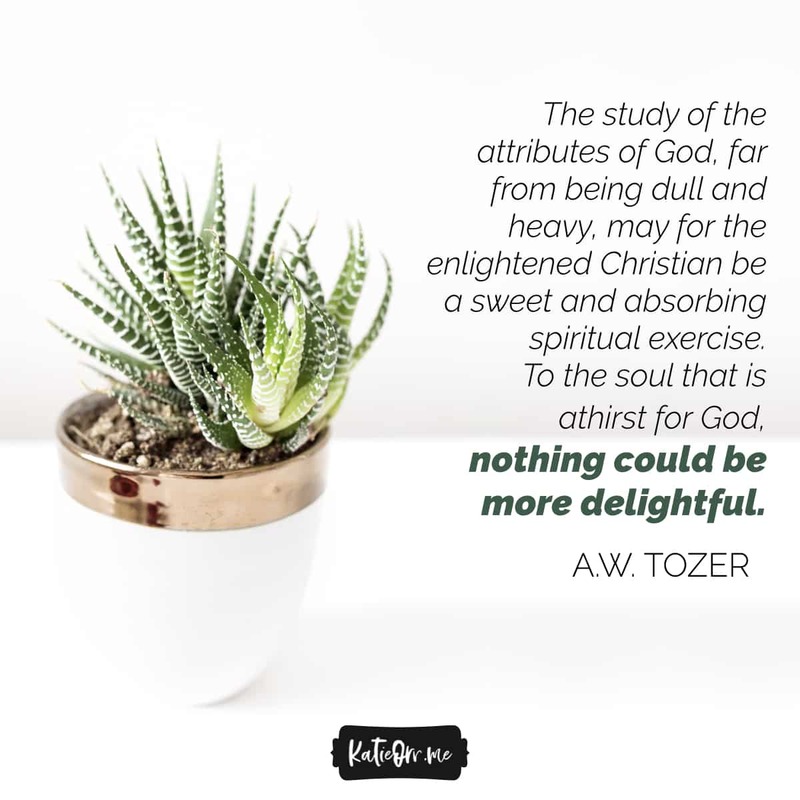 Tozer, The Knowledge of the Holy Full Disclosure: At no additional cost to you, I earn a commission if you click this link and make a purchase. Thanks for your support! I believe the greatest measure of spiritual growth is not how good we’ve become. The most accurate marker of our maturity in Christ is the way we see our God. If our view of Him is small, so will be our faith. When our mind’s eye sees God as small and indifferent, our heart’s cry for Him will be the same. “What comes into our minds when we think about God is the most important thing about us” — A.W. Tozer, The Knowledge of the Holy Full Disclosure: At no additional cost to you, I earn a commission if you click this link and make a purchase. Thanks for your support! These quotes are from a gem of a book— a small yet deep survey of who God is Full Disclosure: At no additional cost to you, I earn a commission if you click this link and make a purchase. Thanks for your support! . This is one of those books that would be fruitful to read yearly. There is so much that we can learn from this classic. Here are 10 of my favs from A.W. Tozer’s The Knowledge of the Holy Full Disclosure: At no additional cost to you, I earn a commission if you click this link and make a purchase. Thanks for your support! . “When the Scripture states that man was made in the image of God, we dare not add to that statement an idea from our own head and make it mean ‘in the exact image.’ To do so is to make man a replica of God, and that is to lose the unicity of God and end with no God at all. It is to break down the wall, infinitely high, that separates That-which-is-God from that-which-is-not-God” (p. 7). “We can never know who or what we are till we know at least something of what God is. For this reason the self-existence of God is not a wisp of dry doctrine, academic and remote; it is in fact as near as our breath and as practical as the latest surgical technique” (p. 28). “Need is a creature-word and cannot be spoken of the Creator” (p. 32). “There is no reason for us to try to discover what has not been revealed. It is enough to know that God is God” (p. 46). “How completely satisfying to turn from our limitations to a God who has none” (p. 47). “The immutability of God appears in its most perfect beauty when viewed against the mutability of men. In God no change is possible; in men change is impossible to escape” (p. 50). “God knows instantly and effortlessly all matter and all matters, all mind and every mind, all spirit and all spirits, all being and every being, all creaturehood and all creatures, every plurality and all pluralities, all law and every law, all relations, all causes, all thoughts, all mysteries, all enigmas, all feeling, all desires, every unuttered secret, all thrones and dominions, all personalities, all things visible and invisible in heaven and in earth, motion, space, time, life, death, good, evil, heaven, and hell” (p.56). “God’s holiness is not simply the best we know infinitely bettered. We know nothing like the divine holiness. It stands apart, unique, unapproachable, incomprehensible and unattainable. The natural man is blind to it. He may fear God’s power and admire His wisdom, but His holiness he cannot even imagine” (p. 104). Want to study more about God? I’ve put together a reading plan with Bible verses about God. This reading plan bookmark includes 12 different truths about God put into an easy-to-use reading plan bookmark. Perfect to help you BELIEVE BETTER! Click the button below to head to the resource library. 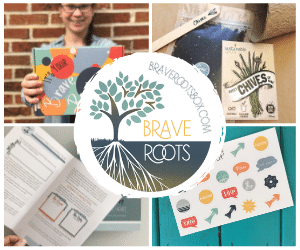 Follow the instructions to create a Resource Library account—it only takes about 30 seconds. 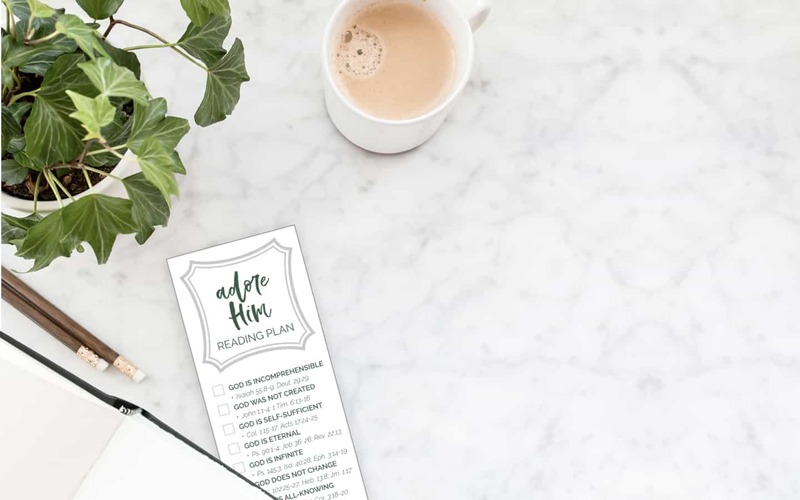 Download the plan, print, and enjoy! “What comes into our minds when we think about God is the most important thing about us.” —A.W. Tozer, The Knowledge of the Holy Full Disclosure: At no additional cost to you, I earn a commission if you click this link and make a purchase. Thanks for your support! When our view of God is off, it affects everything about us. As I look back on my early days as a Christian, hindsight clearly shows this reality at work. I saw God as holy and powerful, but I didn’t see Him as near and engaged. I was terrified of the idea of surrender because I didn’t really believe that God knew me. I figured He could know me well if He wanted to, but I wasn’t convinced that He did. Once I began to understand not only the power and holiness of God, but the love and mercy of God as well, my attitude and actions toward God changed. I started running to God instead of drifting away. I desired to learn more and more about this God who knew me completely and perfectly—and loved me still. So, yes. What we think about God is the most important thing about us. Because it is the main factor that either fuels or dampens our desire to be with Him. 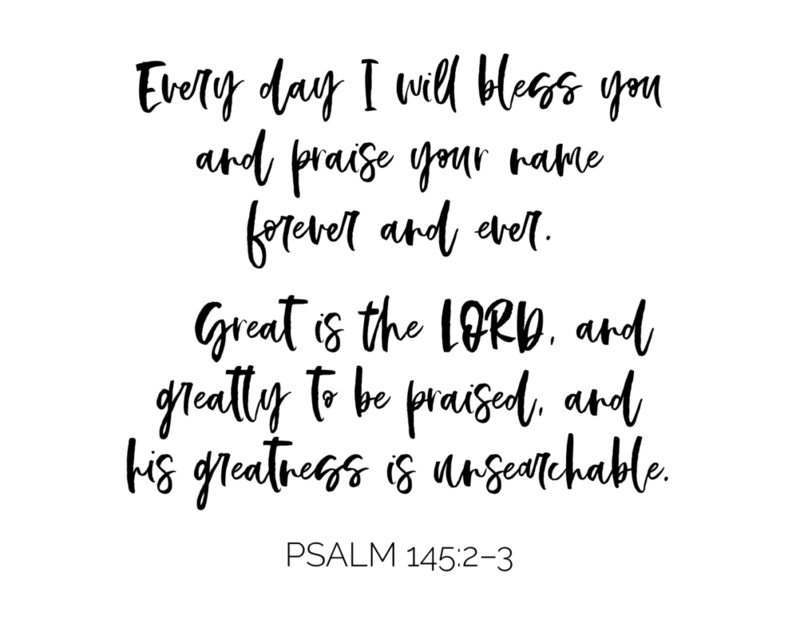 With this in mind, let’s set our minds on the GREATNESS of God! Oh, the depth of the riches and wisdom and knowledge of God! How unsearchable are his judgments and how inscrutable his ways! “For who has known the mind of the Lord, or who has been his counselor? Or who has given a gift to him that he might be repaid?” For from him and through him and to him are all things. To him be glory forever. Amen. Remember this and stand firm, recall it to mind, you transgressors, remember the former things of old; for I am God, and there is no other; I am God, and there is none like me. Want to read more about the greatness of God? I’ve got just the thing for you. This reading plan bookmark includes 12 different characteristics of God put into an easy-to-use reading plan bookmark. 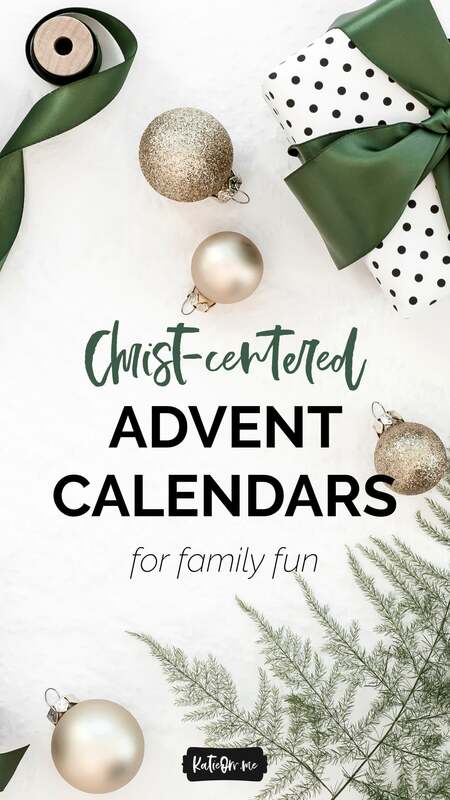 You can use it for 12 days of Bible reading, or take one characteristic per month for a year-round resource. 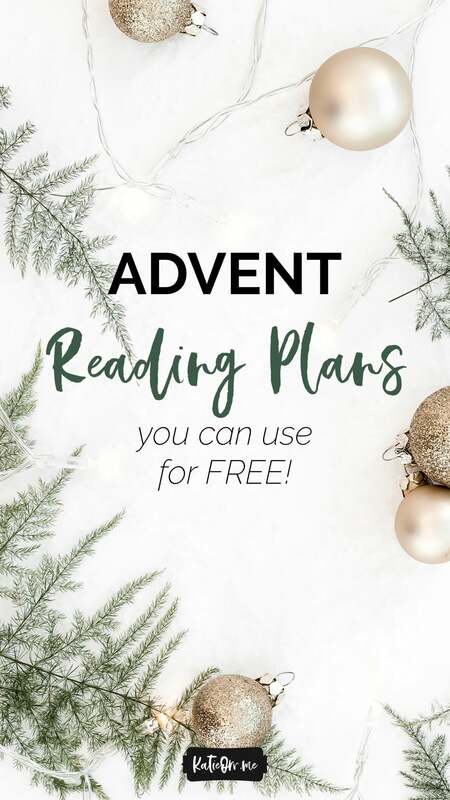 For a limited time, this reading plan is FREE. 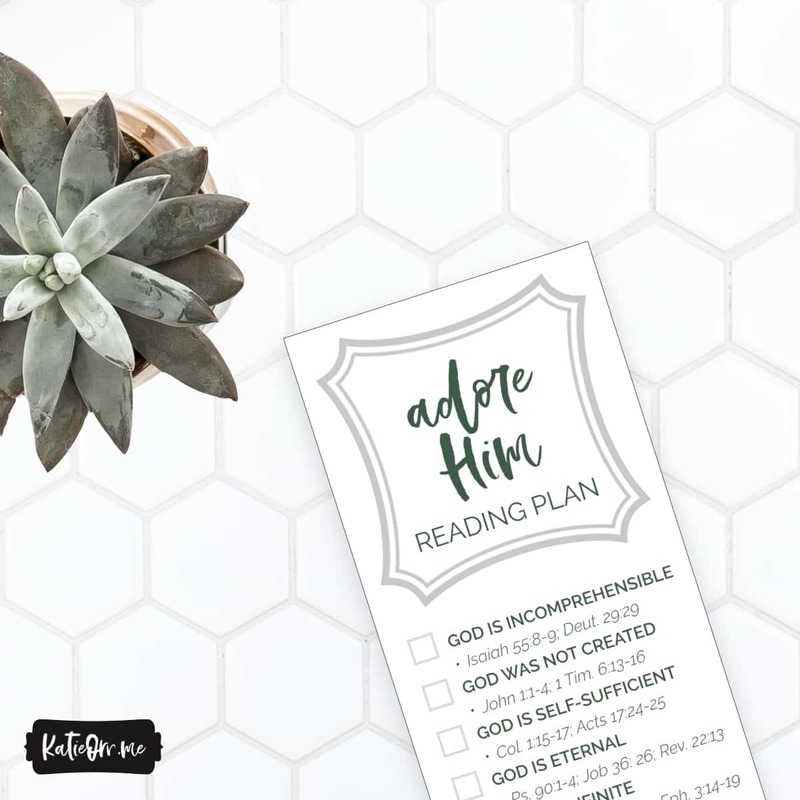 ​Here’s how to access the Adore Him reading plan. Not one of us tries to do take a verse out of context, yet we all inevitably do. We might read into a verse something that it wasn’t intended to speak into. Other times we miss important key truths the original author meant to be understood from his words. We forget to keep in mind the reason the words were penned in the first place. There is much that goes into a careful interpretation of Scripture, but it doesn’t need to be complicated. 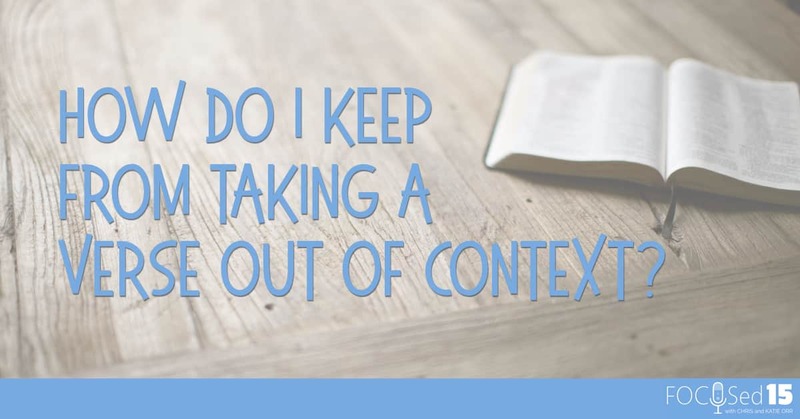 Listen in for a few quick tips for keeping the context in view when you read and study any verse of the Bible. 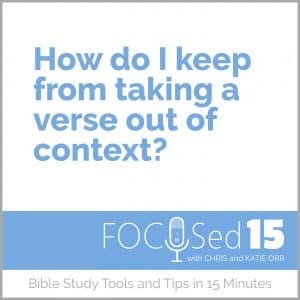 I’M LISTENING TO: How can I keep from taking a verse out of context? Why we need to keep the context of each book of the Bible in mind when we study a verse. A real-life example of why context is important for interpreting the meaning of words. Several helpful tips for figuring out the context of each book of the Bible. A quick and easy context “hack” to begin to understand the context of a verse when you’re looking up a verse in the middle of a book of the Bible. Importance of keeping all verses not only within the context of the book, but also within the whole counsel of Scripture. Study Bibles (We both use the ESV Study Bible – A great resource to keep the context in mind. Includes all the basic info you would need to know about a book (author, audience, aim) and more. 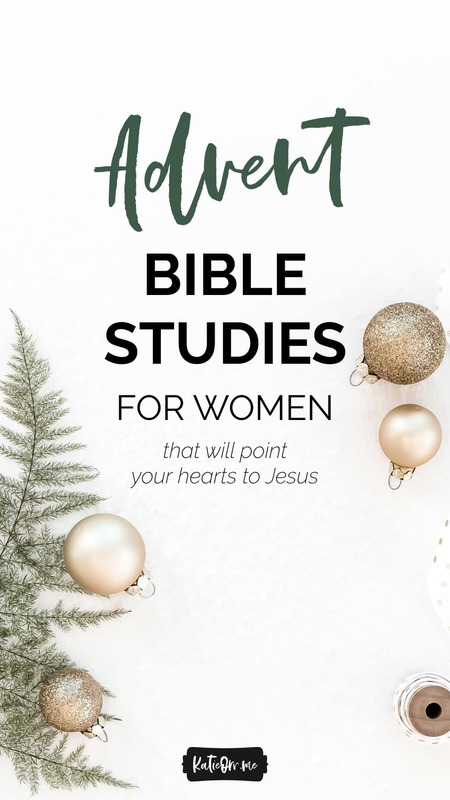 https://katieorr.me/wp-content/uploads/2012/01/pexels-photo-141676.jpeg 750 750 Katie https://katieorr.me/wp-content/uploads/2018/11/bible-study-for-women-6-1.png Katie2017-03-27 04:30:552019-04-01 11:46:42How can I keep from taking a Bible verse out of context? We’ve covered consistency, translations, time, commentaries, and more. Today let’s chat volume. Have you wondered how many Bible verses you should study at one time? Is just one enough? Or should it be 10 verses a day? One chapter at a time? 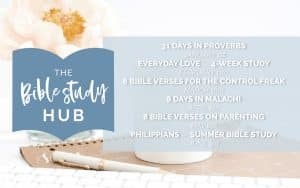 Join Chris and I as we talk about how to figure out the appropriate amount of verses to study, depending on your goals. 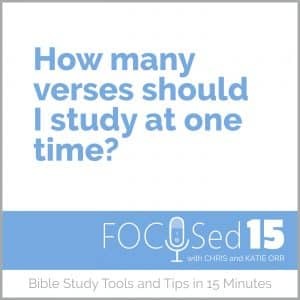 Have you wondered how many Bible verses you should study at one time? https://katieorr.me/wp-content/uploads/2012/06/pexels-photo-132750.jpeg 750 1124 Katie https://katieorr.me/wp-content/uploads/2018/11/bible-study-for-women-6-1.png Katie2017-03-20 04:30:002019-04-01 11:46:42How many Bible verses should I study at one time?